Underactive thyroid disease or hypothyroidism is diagnosed and managed in Primary Care in the UK. This review of hypothyroidism on A4Medicine presents the GP with a quick reference on this topic. Hypothyroidism can be primary or secondary. The causes of primary hypothyroidism are mentioned for eg iodine deficiency, autoimmune thyroiditis, drugs, surgery, transient thyroiditis, infiltration and congenital causes. Results suggesting subclinical hypothyroidism are mentioned and the rationale behind repeating the tests in few months time is to r/o transient causes of a rise in TSH. A box representing the variety of symptoms of primary hypothyroidism can be used during the consultation and suggested investigations are mentioned. Pharmacological management of hypothyroidism is by thyroxine replacement therapy. 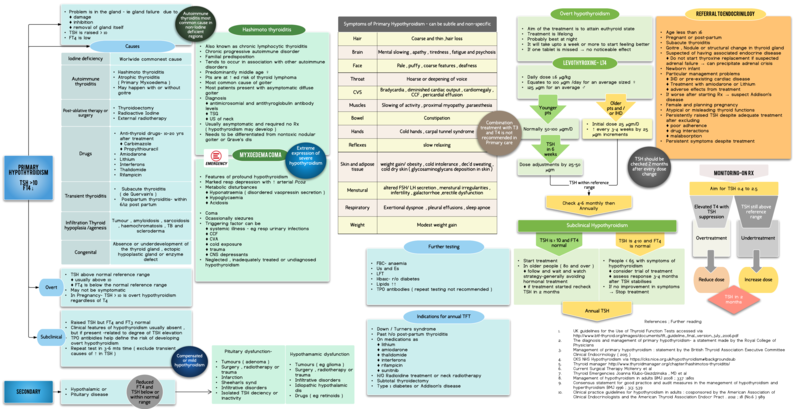 A simple flow chart displays how to initiate and monitor thyroxine replacement therapy. Referral criteria for endocrinology for further opinion are shown clearly.